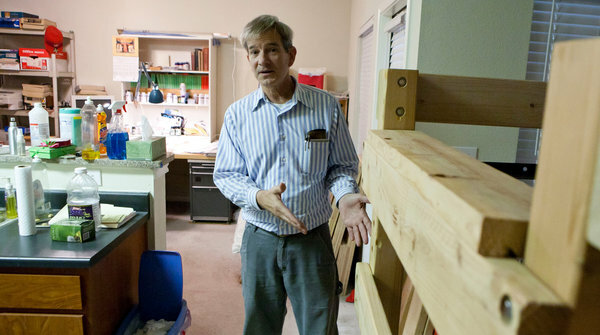 Dan Tolleson, an unemployed Houston resident, showing a bunk bed system he designed. Dan Tolleson, a researcher and writer with a Ph.D. in politics, has been out of work since 2009, except for brief stints as a driver. Still, he opposes President Obama’s call for Congress to renew extensions on unemployment benefits. Theresa Gorski of Dearborn, Mich., unemployed for 17 months, headed to teach catechism class. President Obama wants to continue offering benefits for an extended period of time, a maximum of 99 weeks, as is now the case. The measure is part of his jobs bill, which he once again called on Congress to pass in a press conference on Thursday. If the extension is not renewed, benefits for more than 2.2 million people will be curtailed by mid-February, according to the Department of Labor. The Obama administration estimates that with no extensions, a total of six million people will run out of benefits over the course of next year. Unless job growth picks up sharply, many of those people will struggle to stay out of poverty. Unemployment benefits, which average $298 a week, help families and serve as economic stimulus because most of the money gets spent right away on basics. Liberal and many centrist economists say that the economy is too weak now to withstand the shock of a sharp drop in those payments. Still, conservatives contend that extending benefits pulls money from other parts of the economy, discourages people from finding work and increases the unemployment rate. Some Republican politicians have gone so far as to suggest that people living on unemployment are simply lazy. Even President Obama’s pick for head of the Council of Economic Advisers, Alan B. Krueger, has acknowledged that increasing unemployment benefits prolongs unemployment, as conservatives were quick to point out when he was nominated in August. To some taxpayers, unemployment extensions are just another big government expenditure that comes out of their pockets and goes into someone else’s. Some would rather see the money spent on projects with a return, like building highways and schools. Others prefer freeing businesses of expenses like the health care plan and new regulations. Even among those struggling to find work, Mr. Tolleson is not alone in his views. In a recent survey of the unemployed by Rutgers University, more than one in four respondents was opposed to renewing the current extended unemployment benefits. Three out of five said recipients should be required to take training courses. Theresa Gorski, a pharmaceutical sales rep in Detroit before losing her job 17 months ago, once shared his skepticism of prolonging unemployment benefits. This recession has left more people unemployed for longer than ever before. In September, nearly seven million people were receiving unemployment benefits, and the Census Bureau says the payments lifted more than three million people out of poverty last year. Keeping the extensions in place for another year would cost $49 billion, the White House estimates. Unemployment benefits vary from state to state and are based on the worker’s previous earnings, with most states using a tax on employers to cover 26 weeks after a job loss. In mid-2008, the federal government began to pay for a series of extensions that brought that total to 99 weeks in the states with the highest unemployment rates. About 20 states now offer the maximum of 99 weeks, but under Mr. Obama’s proposal, that would drop to nine states in March and three in April. That would leave most states offering about 70 weeks of benefits. Preston Venzant of Houston lost his job as a technician repairing appliances three months ago. Republican leaders in Congress have not said whether they will support the extensions, but they have opposed them in the past. In a Congressional hearing Thursday, they expressed frustration that repeated renewals of the extensions had not yielded better results. Economists generally agree that unemployment benefits encourage some job seekers to delay accepting a job, thus raising the unemployment rate. A study by the San Francisco Federal Reserve last year found that the benefit extensions had increased the rate by four-tenths of a percentage point. A more recent paper by Jesse Rothstein, an economist at the University of California at Berkeley, found that about half the increase was simply because recipients were required to look for work and therefore continue to be counted in the labor force. Otherwise, many would have dropped out. Only people actively looking for work are counted among the unemployed. Though his nomination was approved by a Senate committee on Thursday, Mr. Krueger is avoiding speaking publicly as he awaits confirmation. That has prevented him from defending himself to those conservatives who have happily cited his acknowledgement that benefits may prolong unemployment. But he has written that the impact was likely to be smaller in a harsh economic climate. In a study conducted between fall 2009 and spring 2010 in New Jersey, Mr. Krueger and his co-author, Andreas Mueller, found that only one out of five unemployed people had received a job offer, and that workers did not spend more time looking for work or lower their acceptable salary level after their benefits lapsed. In interviews, job seekers insist they are applying for jobs at salaries far below what they are used to, in fields they have never worked in before, and are still not having any luck. Preston Venzant, 47, who lost his job in Houston repairing commercial kitchen equipment, said he had decided not to apply for unemployment benefits over the objections of his wife. After months of looking, Mr. Venzant said, he has gotten an offer that will give him two years of work, with free room and board and five weeks’ vacation. All he has to do is move to Russia. Copyright 2011 The New York Times Company. Reprinted from The New York Times, National, of Friday, October 6, 2011.